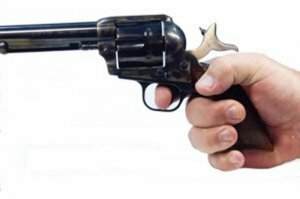 We tested three single-action revolvers suitable for Cowboy Action shooting in an August 2012 showdown. All chambered in the most common CAS competition caliber, 357 Magnum, the choices were the Ruger New Vaquero NV-34 No. 5107, $719; the Heritage Manufacturing Big Bore Rough Rider RR357CH4, $500; and Cimarron’s Evil Roy No. ER4104, $770. The Heritage and the Cimarron revolvers stayed true to the look of the Colt single action, with case-hardened frames and wood grips. The Ruger had a few modern innovations under the skin, as well as modern-looking black plastic grips and stainless screws. The overall sizes and weights were similar, with the major difference being the 5.5-inch barrel on the Cimarron Evil Roy, compared to the 4.6-inch-long barrel on the Ruger and the Heritage Rough Rider’s 4.75-inch barrel. Shooters tested all three for function and accuracy, shooting bench groups at 10 yards using a sandbag rest and two modern loads and one cowboy-action load. The modern selections were Winchester USA’s WinClean 357 Magnum 125-grain load and the company’s 38 Special +P 125-grain choice. The cowboy action load was Black Hills Ammunition 38 Special Cowboy Action choice, with a 158-grain cast lead bullet. Cimarron’s Evil Roy No. ER4104, $770, was the top vote-getter in this match-up of 357 Magnum single-action wheelguns. Cimarron Firearms’ Evil Roy is made by Uberti, the Italian maker of many replica brands of revolvers from the percussion age of the 1830s as well as cartridge guns from Colt, Marlin, Sharps, Smith & Wesson, Winchester, and into the early 20th Century. Out of the box, Uberti’s spaghetti wheelguns are popular among Single Action Shooting Society (SASS) competitors. But some shooters are willing to pay for a better product over the counter, and the Cimarron Evil Roy is the SASS-tuned version of the Uberti-made standard Model P single-action revolver, which is based on the 1873 single-action Colt Peacemaker. It’s made to the specifications of world champion “Evil Roy” Gene Pearcey, who notes in his classes (EvilRoyShootingSchool.com), that SASS competition boils down to speed — hit all the metal plates as fast as possible. Among the speed improvements, the front and rear sights are slightly wider than normal, thus faster to acquire. Roy’s front sight measured 0.096 inch wide compared to the 0.090-inch-wide front sight on the Ruger and 0.1-inch-wide blade on the Heritage. Evil’s rear notch measured 0.142 inch wide compared to the Vaquero’s 0.138-inch width and the Heritage’s 0.115-inch notch width. Internal tuning by the Cimarron gunsmiths became obvious when we started to shoot. The trigger was lightened to just 2 pounds, and the cylinder rotation was especially smooth for firing, loading and unloading. Our testers praised the smooth 0.125-inch-wide, lightened trigger, and they found that the Evil Roy shot to point of aim without adjusting the sights. The slim checkered European walnut grips, case-hardened-color frame, and blued barrel give the Evil Roy an authentic look, while the tuning has it weighted well for a good feel. We had no functional issues with the Evil Roy: the hammer did not hit the webs of our hands, cylinder rotation was smooth, and the ejection rod swiveled away from the barrel like the Heritage, protecting our fingers from barrel burn. The fit and finish on this gun was excellent. The ejector rod lines up precisely with the loading trough for quick and easy loading, and the chambers easily released empty cases without sticking, even when firing hot magnum cartridges. There were no failures to fire with any load tested. Two niceties we appreciated on the Evil Roy were (above) no hammer bite, and (below) an ejector rod tab that rotated down and away from a hot barrel. The Cimarron keeps the original Colt design with the firing pin on the hammer, which has been proven to fire if dropped directly on the hammer down on a loaded chamber. Like the Heritage, the Cimarron also employs a hammer block safety. To load, pull the hammer back halfway, which locks the hammer and trigger. The cylinder is locked, so open the loading gate and insert shells. To fire, pull the hammer all the way back to lock. The Cimarron proved to be the most precise revolver in the test, showing both accuracy on target and consistent groups. With this gun, we shot the smallest single group and average group size with the Winchester .38 Special +P at 1.6 inches, and 1.9 inches respectively. The Evil Roy also shot the highest average velocity with all three types of ammunition. Our Team Said: Each of the revolvers has its good points and its faults. The Ruger Vaquero has some modern innovations that make it less traditional, but potentially safer to keep around the house. Heritage’s Big Bore Rough Rider is a good value at 70% the price of the Ruger, but needs some smoothing. The Cimarron Evil Roy was our favorite because of the smooth function of the action and accuracy. But it is the most expensive of the three, and it lacks a transfer-bar safety, which is only a problem if the loaded pistol is dropped directly on the hammer over a live round.